Today cases are evolving every day in look, functionality, and practicality. Most cases offer a great solution but obvious flaws in one of these fields. 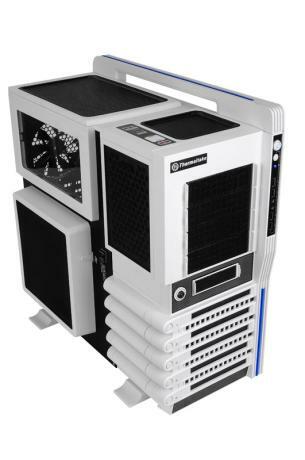 With that we have found the Holy Grail: The Level 10 GT from Thermaltake. We have seen and reviewed the “normal” version of the Level 10 GT but today we have the Snow Edition: A White rendition of the already popular case. Don’t let the good look fool you. Level 10 GT – Snow Edition is a streamlined computer case engineered to accelerate cooling and offers full suite of technical features that redefines the definition of performance PC. Three oversized 200mm ColorShift fans and one 140mm TurboFan ensure your high-end graphic cards, CPU and hard drives are all quietly cooled. The keyword is “quietly”. All intake fans come with built-in filter that can be easily cleaned without the use of any type of tools. Plug&Play side panel fan, 240mm high-efficiency water cooling radiator support and much more.